#330 MINIATURE BULB MIDGET FLANGE BASE - 14 Volt 0.08 Amp 1.12 Watt T1-3/4 Midget Flange Base, 0.50 MSCP C-2F Filament Design, 1,500 Average Rated Hours, 0.63″ Maximum Overall Length. 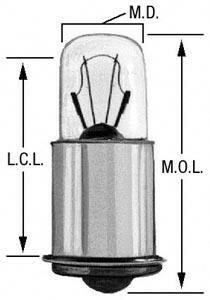 Hood-mounted turn signal bulb for 69-70 Charger, reproduction. Special bulb for hood-mounted turn signals. Sold individually. Use 2 per car.